What wireless charger do you like? I’m upgrading to the iPhone XS from the 7 Plus this year and I’m eager to switch to wireless charging. I have no idea what wireless charging stations are good. Anyone have any recommendations? 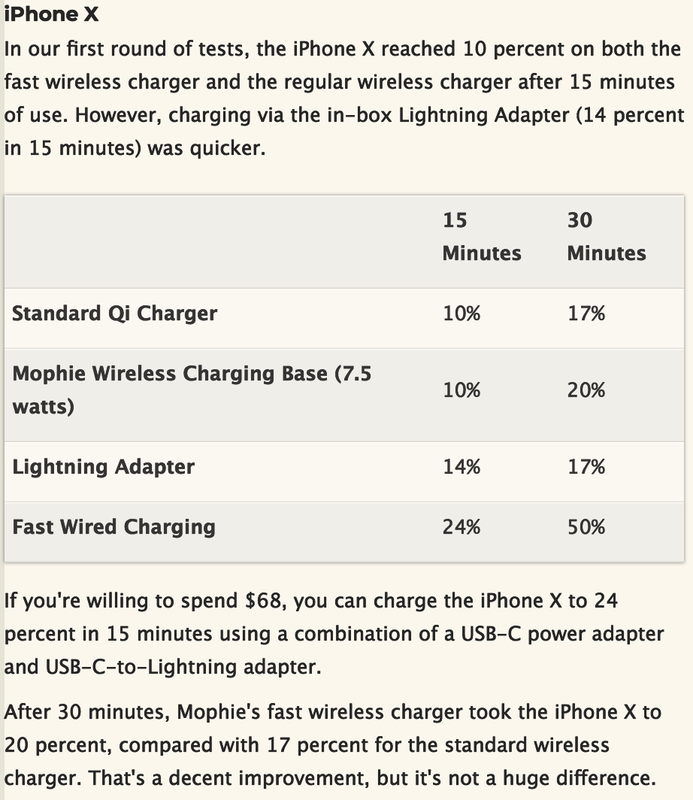 I can’t recommend a specific unit, but I’ve shied away from wireless charging because there is no inductive wireless charger sold today that is as fast as a fast wired charger. @bowline Thanks for the info. Yeah, I am aware of that negative aspect…luckily I have plenty of corded chargers strewn throughout the house. I guess “switch” was the wrong word, cause I’m not planning on getting rid of my corded chargers – just changing some of them out for inductive ones. Locations when I am “planted” throughout the day like my desk and nightstand don’t really need fast charging. Would still love to hear recommendations if anyone has them. Bought these as a gift. All I can say is they work. I bought two of these Anker 10W Chargers. My wife uses one on her nightstand for overnight charging and I have one on my desk at the office. I wasn’t concerned with the charging time, just looking for something with the wireless convenience. They work fine with our iPhone 8+'s. They have a blue led light on the side that lights up when you first place the phone on it to indicate it has a connection and then the light turns off. I also have this setup on my desk and they work really well. Easy to unlock the phone by tapping the screen and glancing over at the phone due to the angle of the screen. For a flat surface charger next to my bed I have a Mophie which, again, does exactly what it is designed to, reliably. I’m thinking this is probably what I’m going to do as well. Which Mophie are you using? Guess the speed is less of an issue for me. My iPhone X last the entire day easily, and then sits on my wireless charger overnight. Works well for me. Perhaps others place more demand on their phones over the course of the day. Don’t miss the plug-in charger at all. I use the original Mophie Wireless Charging Base that Apple sells - came out the same time as the iPhone X. The mophie charging base uses the latest Apple technology to wirelessly charge your compatible iPhone faster than traditional adapters. Buy now at apple.com. It’s been great and no issues lining up the phone on the base. Works fine through my Otterbox case as well. We also have a couple of those Mophies and I still think they are among the best (of the lying down variety of charger). I tried an Anker charger, thinking I could save some money, but since they don’t come with a wall adaptor you eithe rhave to sacrifice one of your existing ones or buy a new one, which pushes the price to NEARLY that of the Mophie unit. So there’s not much saving going on with Anker. I also found the Anker to be smaller and lighter. The charger itself, when not in use, was easily moved or couldn’t stay flat (if there was, for example, a twist in the cable). BEcuase it’s smaller, it is also much finickier to position a phone on. I found that it was harder than the Mophie to align the coils, and becuase its footprint was smaller, the phone had to balance a bit on the charger (at least with my 8 Plus). Oh, and the lights on the Anker units are a bit bright for the bedroom. So all told, I found with the price of the Anker not being substantially lower, and the clear lower quality, the Mophie was the best buy. Easy placement, unit stays put, looks attractive, subtle lights suitable for the bedroom. It’s an all-star. if you want a stand-up charger for your desk though, I suspect one of the Anker would fit the bill! I do love Anker stuff, they just kinda missed the mark with flat inductive chargers in my opinion. Good to know! I have both in my Amazon cart and was trying to make the decision. Mophie it is. I’m in the market for a good wireless charging mat that I can charge my new AirPods and the Apple Watch series 4 that I will be adding to the line-up soon. I want to be able to charge both of them at the same time. Can anyone recommend a good charging mat for my needs? I was thinking of getting one of these Nomad three-device chargers. Alright, it looks good. I don’t have a need for a three-party charging mat as I still have an iPhone 7 that I’m not really considering doing away with yet. And I’m not completely sold on that Watch-stand that the Nomad has. I prefer it to be flat. But thanks for the heads up! How long do you think it will retake for an ordinary charging mat to completely recharge the Apple Watch? Will it be slower than with a wire?